Are you reaching your goals? As moms we can have 100s of great ideas but are we actually achieving them? Yes, the most important thing we need to do is keep our kiddos alive and well. But what about after that? I was really inspired when I met Becky from Tales of Beauty for Ashes She was busy mom just like all of us, but she has her bucket list on her blog, and is actively accomplishing her dream! Stuck in the dreaming phase? There is a way to break out, but it might not be what you think. You can’t walk around dwelling on all the things you need to get off your bucket list. Instead Look for Opportunities. When great opportunities come your way, be brave, seize the moment! Be flexible with your dreams. Certain dreams work better at particular times of life. Be ok with that. Chase the dreams that can happen now. 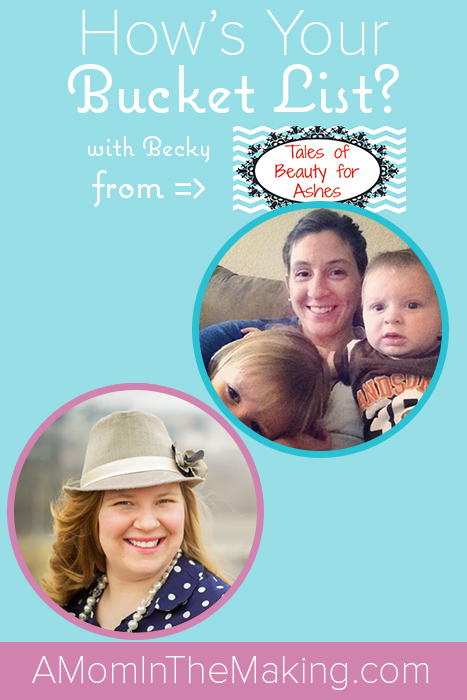 Becky has inspired me to share some things I’ve knocked off my bucket list. Where should I start? Leave a comment below for which story you’d like to hear? How I made $1,000 in one day. How I paid off $100,000 in debt. How I wrote and illustrated my first book. P.S. If you need a little inspiration for getting things done on your bucket list, here’s the video that Becky mentioned in today’s episode. It’s a video of her learning to drive stick shift!! !